The Lenovo ThinkSystem SD530 is a single platform designed to excel not only at critical enterprise workload environments (such as virtualization, hyperconverged infrastructure, and cloud), but also at High Performance Computing (HPC) and Artificial Intelligence (AI). Combining the efficiency and density of blades with the value and simplicity of rack-based servers, SD530 could very well be the most adaptable server on Earth. The innovative design of the D2 enclosure provides the flexibility to meet varied needs in the modern data center. For example, multiple D2 Enclosures can be easily daisy-chained together and then managed as a single unit, which reduces cabling costs by as much as 92%, compared to the previous generation,* and simplifies administration. Today’s IT managers are always driven to do more with less. The SD530 handles twice the workloads per U of traditional 1U servers. In a single 42U rack you can mount up to 76 servers with: Up to 152 processors, 4,256 cores, 77.8TB of memory, and 3.6PB of storage.† SD530 provides 32 more cores per U than the previous generation* while maintaining drive density of up to 6 SFF drives per node with up to two direct-connect NVMe SSDs—all within industry-standard racks. For software-defined storage and hyperconverged workloads that need significant local storage, SD530 offers ideal storage density and capacity. Support for U.2 SSDs provides ample performance to meet increasing business demands. Internal M.2 boot drives enable increased capacity and significantly more reliability than the SATADOM solutions used today. SD530 is engineered to run the highest-core Intel® Xeon® Platinum processors to power through your most demanding HPC or AI workloads. With the increasing demand for GPU technology across many use cases including VDI, HPC, and Machine Learning, the SD530 supports a variety of GPUs—including the latest NVIDIA Tesla V100. The innovative D2 Enclosure accommodates an optional 1U tray that supports two GPUs or accelerators per node (two trays maximum per D2 Enclosure). The SD530 delivers the density of blades with the economics of rack systems. By utilizing a single platform designed to excel at both enterprise and HPC workloads, ThinkSystem SD530 was engineered for flexibility and enables you to reduce qualification and test times and increase your flexibility by using common components and management. This is accomplished through the revolutionary design of the D2 Enclosure. The front of the unit holds up to four nodes that are “warm-swappable” to maximize uptime. Individual nodes can be removed without powering down the remaining three nodes. Each SD530 node contains processors, memory, and up to six 2.5" storage devices. The rear of the D2 Enclosure contains a “shuttle” with power supplies, fans, adapter slots, and networking and management ports. By disaggregating the adapter slots and NICs (both LOM and PCIe) from the nodes, the unique shuttle designs provide maximum I/O flexibility. 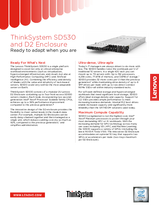 Both shuttles support 10Gb Base-T, 10Gb SFP+, or no-LOM options, enabling you to install only the LOM/NICs you need for the best networking options within your budget. The shuttles support a wide array of high-speed interconnect fabrics, including OmniPath and InfiniBand for HPC/AI environments, as well as a full range of Ethernet and Fibre Channel cards for more traditional enterprise and cloud environments. Besides the D2 enclosure, Lenovo also provides a modular enclosure for daisy chain management. The modular enclosure provides lower ToR ports cost, lower cable costs, and less rack complexities. The revolutionary design of rear shuttles used with the D2 Enclosure provides maximum I/O flexibility for the SD530 ultra-dense platform. Lenovo servers continue to be the industry’s #1 most reliable§, with the industry’s highest customer satisfaction‡ rating. Supporting the full life cycle of your investment, Lenovo Services are the perfect complement to Lenovo’s world-class enterprise products: Lenovo ThinkSystem servers, storage and networking offerings. As the trusted services provider for thousands of companies around the world, Lenovo has the expertise and experience to help with everything from solutions architecture to implementation, integration, and migration, to proactive management services. Lenovo Services guarantee you a superior service experience, and are delivered through Lenovo service professionals and the network of Lenovo Authorized Service Providers. To learn more about the Lenovo ThinkSystem SD530, contact your Lenovo representative or Business Partner or visit: www.lenovo.com/thinksystem. For detailed specifications, consult the SD530 Product Guide. ¥ Based on Intel internal testing, August 2018. † Assumes 4U of rack occupied by networking or other components. * Compared to Lenovo NeXtScale nx360 M5. § ITIC 2018 Global Reliability Report. ‡ TBR x86-based Servers Report 2018. ** Lenovo recommends limiting the number of modular enclosures in a daisy chain to 7 modular enclosures. Trademarks: Lenovo, the Lenovo logo, Lenovo Services, Lenovo XClarity, NeXtScale, ThinkAgile, ThinkSystem, and TruDDR4 are trademarks or registered trademarks of Lenovo. Intel® and Xeon® are trademarks or registered trademarks of Intel Corporation or its subsidiaries in the United States and other countries. Microsoft® is a trademark of Microsoft Corporation in the United States, other countries, or both. Other company, product, or service names may be trademarks or service marks of others. Document number DS0003, published November 6, 2017. For the latest version, go to lenovopress.com/ds0003.